I used to think this pub was great - central, right next to the tube station and good beer until I left my bag in their last night. Luckily the staff found it and said I could pick it up the next day although I did find it weird that they wouldn't look for it until the pub closed but put it down to the pub being busy. So I travelled all the way in from Staines to pick it up - the staff said they couldn't find it, that none of the staff on were there the night before and that the manager was busy on a conference call / meeting. So I asked them if they could call the manager who was on the night before. The startling answer I received was that they couldn't call him because he wasn't on duty and that 'it would be a personal call'. So I asked them if they could speak to anyone else who was on the night before, and turned out one of them had been on the night before but he didn't remember anyone finding a bag. It wasn't until my girlfriend phoned up and we threatened to call the police that they went up and got the manager down who went downstairs and came back with my bag in his hand. I will never drink there again!!! visited this dump last monday (14/4/14) and ordered cider, what i got was a form of cherryade, bright red and not tasting anything like cider, apparently it was 'wild berry' cider? i complained but the manager ( a weasily skunky sort of chap) would not offer me a proper replacement drink and insisted it tasted ok, it tasted like cherryade, and he was correct in his observations that it tasted ok for cherryade, but not as cider. so only drinking one small mouthfull of this dire sludge and at a cost of almost £5, me and the wife left after exchanging a few choice words with the said weasily skunky chap. he will not have to bother about me darkening his doorstep again and i intend writing to greene king about him and his stinking attitude to customer satisfaction....avoid this dump at all costs while this manager is still in charge. Everything you expect from a Leicester Square pub. Full of Japanese tourists taking photos of their plate of £14 fish and chips. Naturally it gets unbearably crowded quickly and the beer is badly kept. Bar staff are efficient. This pub has young and polite staff, a clean interior and is in the heart of London. The beer and wine selection is fairly standard for a Greene King pub and my pint was pulled of Stella Artois was pulled well. Although our table was wobbly, the interior was clean (possibly too clean with the spray and wiping tables a bit too close to us!) and we sat in the corner looking out onto the main street. 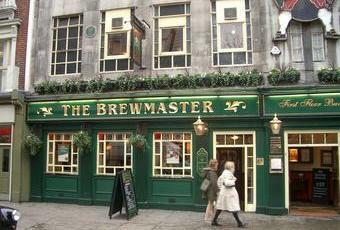 It's a standard pub that's a step up due to it being in Leicester Square. Would visit again for a drink but was too quiet to spend a long time there.